Foundation mare Judith 2925 was born 1931 in Hungary and was by Mersuch I ox out of Hanna ox by Gazal ox. She was imported 1936 by the famous breeder dr Arvid Aaby-Ericsson, at the same time as the stallion Nigro 138 and three other mares. Judith 2925 left nine offsprings of which four where broodmares in the Studbook, Nadja 3953 (born 1940 by Nigro 138), Nadetscha 4087 (born 1941 by Nigro 138), Eroca 4682 (born 1944 by Eros), Diana 5126 (born ? by Jago 115) and one stallion Nerox 207 (born 1938 by Nigro 138). 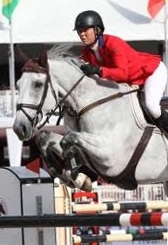 Click here to see Judith 2925 and her descendant in the Swedish Warmblood Association database.